Beat together eggs and water in a small bowl until foamy. Pour into a shallow bowl. Place stuffing mix in a self-sealing plastic bag; finely crush with a rolling pin. Trim fat from chops. Coat chops with crushed mixture. Dip into egg mixture and coat with crushed mixture again. Heat half of the shortening in a large skillet over medium-high heat until it sizzles. Add 4 of the chops; cook for 6 minutes. Turn chops and cook about 6 minutes more or until evenly browned, reducing heat as necessary to prevent overbrowning. Transfer chops to a serving platter; cover to keep warm. Repeat with remaining shortening and chops. 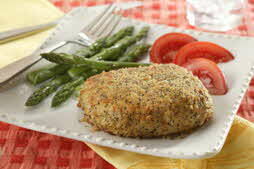 Make guests think that you slaved over these breaded chops. This "No Recipe" recipe contest honorable mention recipe from Gerry Holcomb uses a package of cornbread stuffing mix as a shortcut to great taste.